"For admission purposes, we assume that students pursuing a full IB diploma are taking the toughest academic program available to them and that, as we say above, is what the Committee on Admission generally wants to see." This sentiment is echoed across North Carolina and the United States as colleges seek students who have put themselves in a position to take advantage of the challenges and the opportunities these colleges have to offer. How do colleges recognize IB Diploma students? 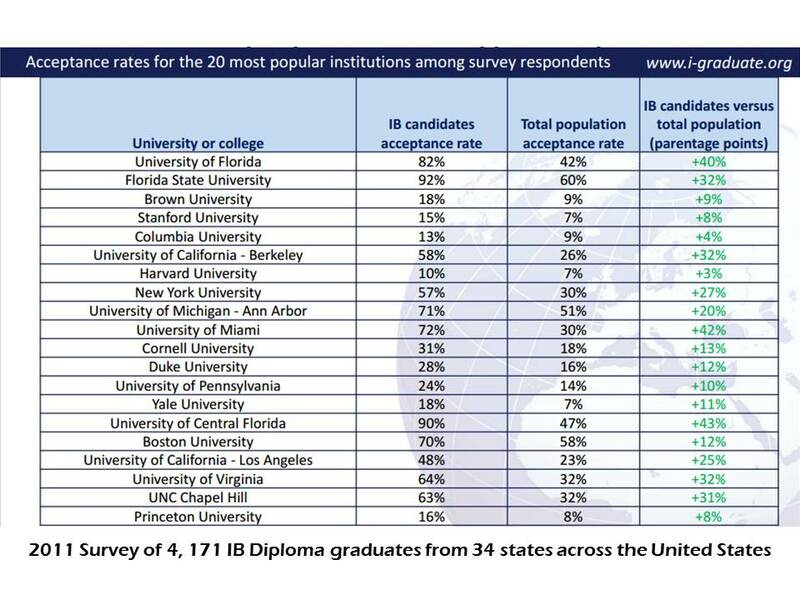 Please see the table below for more information on acceptance rates of IB Diploma candidates. Colleges over the past several years have come to recognize the value and demands of the IB Diploma Programme and the value of its individual courses. Colleges award credit hours for IB courses in a manner that parallels their policies awarding credit for AP classes. In some cases colleges will award significant credit hours for earning the IB diploma. Most, however, award credit hours based on the results of individual scores for each IB course. See the information below to see how colleges reward students with college credit. The table below identifies the course credit awarded a student at UNC-Chapel Hill for the classes listed in the table. This is a sample of what an imcoming student might have taken in his or her IB experience. The credit below also does not include credit that might be earned from AP courses that are frequently taken by IB Diploma candidates, such as Calculus, Statistics, Environmental Science, and various humanities electives. There is no better preparation for success at the university level than the IB Diploma Programme. Diploma Programme students will develop significant research, writing and critical thinking skills that will prove to be of tremendous value and will allow students to take advantage of their university opportunities at the highest level. With a college graduation rate of 58% in the United States, success in the Diploma Programme will allow students to do more than simply survive in college. It will prepare them to thrive! For more on the value of the Diploma Programme and its correlation with success at university, visit our Articles and Studies page.